Won’t you take a stroll with me through my gardens? I love my gardens. I really do. I plan my assorted flowerbeds with care. My goal is to have different flowers blossoming in rotation for six or seven months of the year. Careful planning pays off. I am rewarded with burst of harmonizing colors, fragrant aromas and spectacular blossoms from early Spring until mid Autumn. 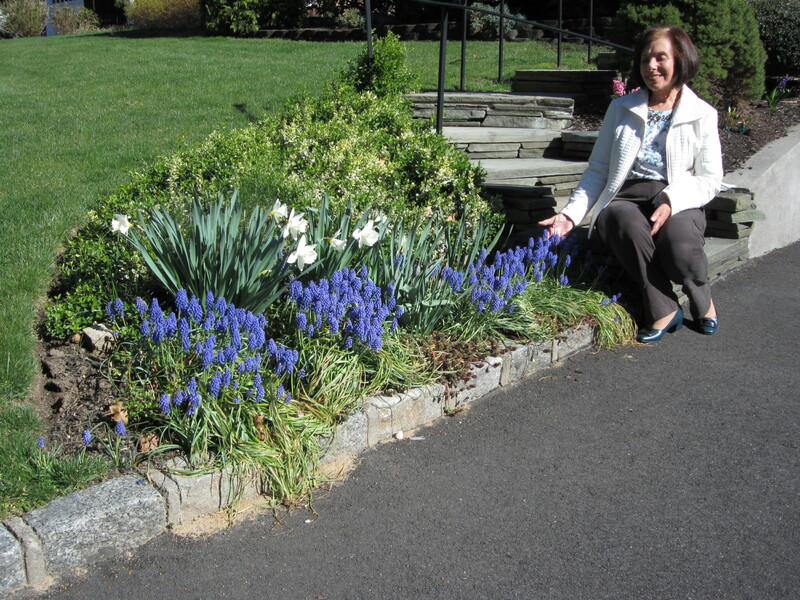 By April Fools’ Day, I begin to see the fruits of my labors: white Snowdrops and pale yellow Daffodils, whose soft colors are a perfect compliment to the blue miniature Grape Hyacinths nestled beside them. Next appear the yellow and white Daffodils and the buds of what open to multi-colored Tulips. There’s a short hiatus before my Iris clusters open, but worth the wait. Their vibrant colors cheer me as walk the path to my back yard. Please join me along that path. I refill my recycled baskets each Spring, and in short order have overflowing bursts of pink and rose Impatiens hanging around the perimeter of my porch. As summer progresses and a Clematis vine twines itself higher on the mailbox post, climbing roses and blue Hydrangea spread out aside the backyard deck and snowball Hydrangea begin to flop over a post and rail fence. Azaleas, Mountain Laurel and Rhododendron each in turn do their floral dance. 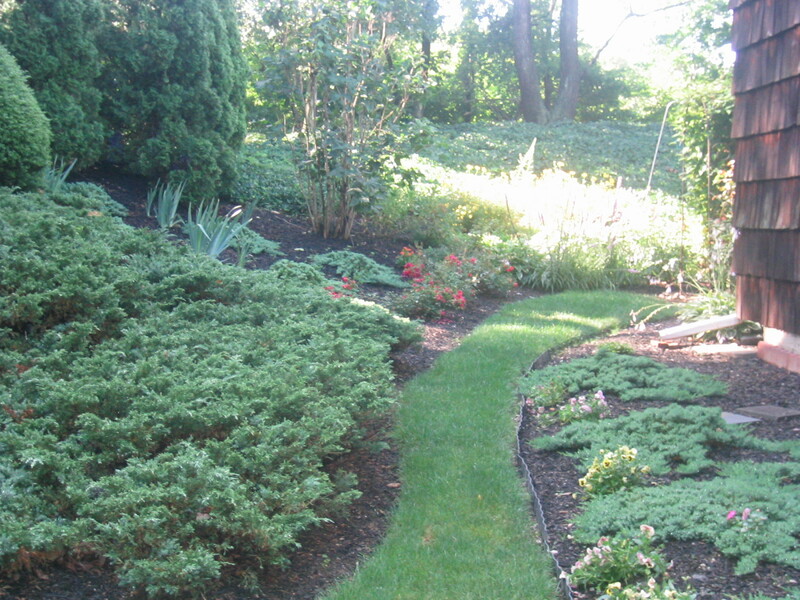 The wooded, shady areas of my back yard also get their due with a variety of Hosta plants, fern and Coral Bell. Continuing to the left is my rock garden. Last year it sported a beautiful fountain. But it met with a bit of a disaster this year. Somehow it got knocked over and cracked right through. Now its base has become of planter. Talk about making lemonade from lemons! But the best is yet to come. Back to the front yard– the Oriental Lilies whose flowing petals and sweet fragrance vie for first prize! So you can see, I love my gardens. But sometimes my gardens don’t love me. Stay tuned. Next time, I’ll explain why. Please visit my Facebook Page take a look around, leave your comments and don’t forget to click on that LIKE button at the top of the screen. Get more info, ‘how to’s’ and ‘what if’s’ about Lois’ Tales2Inspire “Authors Helping Authors” project/contest. FREE – No submission fee. 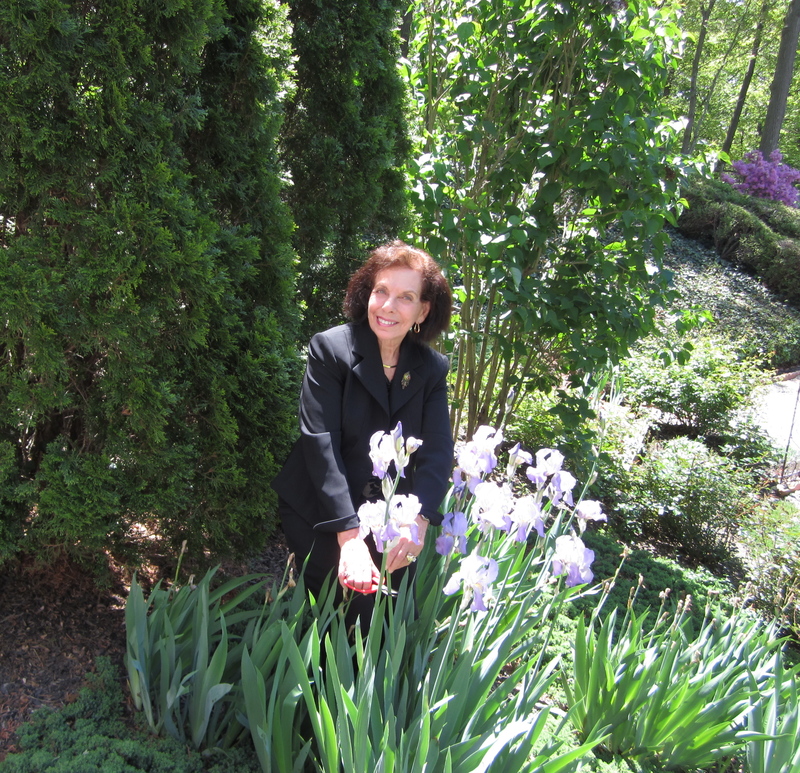 Posted on July 10, 2012, in Making the World a Better Place, Off the Beaten Path, Peaceful Reflections, Words to Inspire and tagged "beautiful gardens", 'peaceful gardens", author, gardens, Lois W. Stern. Bookmark the permalink. 9 Comments. Very lovely. You have a beautiful place. Thanks for the tour. Glad you enjoyed the tour. Thanks so much for taking the time to do so and also to let me know! Lovely! This is one area that I lack, I don’t like gardening, mainly because I am afraid of bees. I admire anyone who can turn a boring yard into a fantasy land! Kudos to you, it’s a very beautiful yard! Thanks for the share! I am not into garnening because it kills my back and I can’t take the heat but I have a houseful of interesting houseplants. Your garden looks like the Garden of Eden must have–so exquitely lovely–you’re a lucky woman as a garden is so soothing to the soul. Yes, Micki, my garden is so soothing to my soul, just a your magical garden is so soothing to yours! Your gardens are beautiful. I enjoy sitting in the early morning to my day lilies bloomin the sunlight. As the sun hits them they slowly begin to expand before bursting open to meet the day. It is a beautiful site to see. Hi Lois, We have something in common. I too love my gardens and work on them all the time. even in the horrid heat here in Va. (It helps me lose weight, LOL). Been out there all day yesterday and today, cleaning, weeding, feeding, propping up gladiolas’s and oriental lili’s, trimming crepe myrtle, oh and raking pebbles. It’s a lot of work, but I’m so glad God allows me to work through. Anyway, We both seem to have the same likes as far as flowers and arranging them in particular gardens. 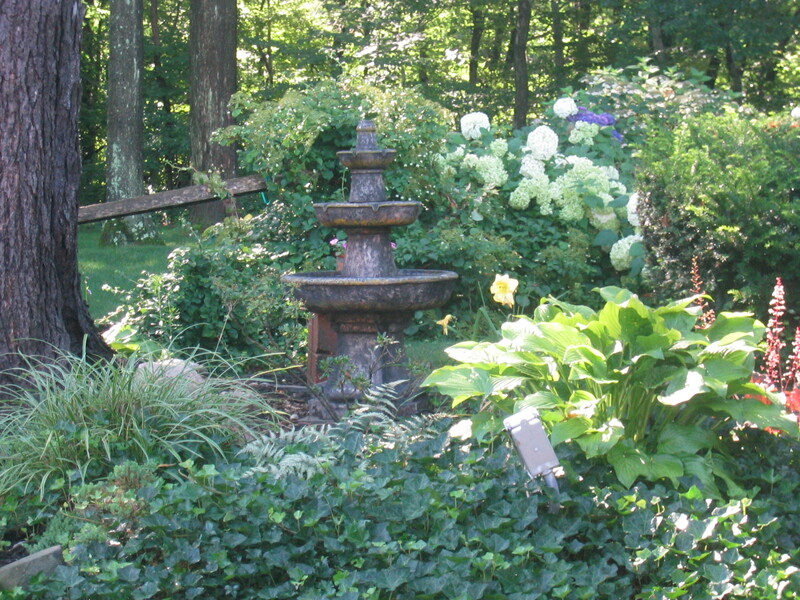 I love to work in rocks, wood, some metal, and of course, fountains. Thanks for the wonderful tour. It’s beautiful indeed. Keep enjoying your beautiful gardens and your gardening, but be careful in this extreme heat and don’t overdue. You want to stay healthy to enjoy the fruits of your labors! Do you ever end up with poison ivy? That’s the down side to gardening for me. Sometimes my gardens just don’t lie me – the topic for my next blog. If you think you might have an inspiring story about gardens (or anything else for that matter) check out Tales2Inspire, my “Authors Helping Authors” project/contest. It’s FREE and gives authors some great exposure. Gloria, and isn’t the fragrance of tho lilies exquisite? At least the Asian lilies, which cast forth an aroma as beautiful as any fragrance I have ever purchased in a bottle! Best to you. Keep living in beauty.